Would the USS Midway be fun for anyone but me? 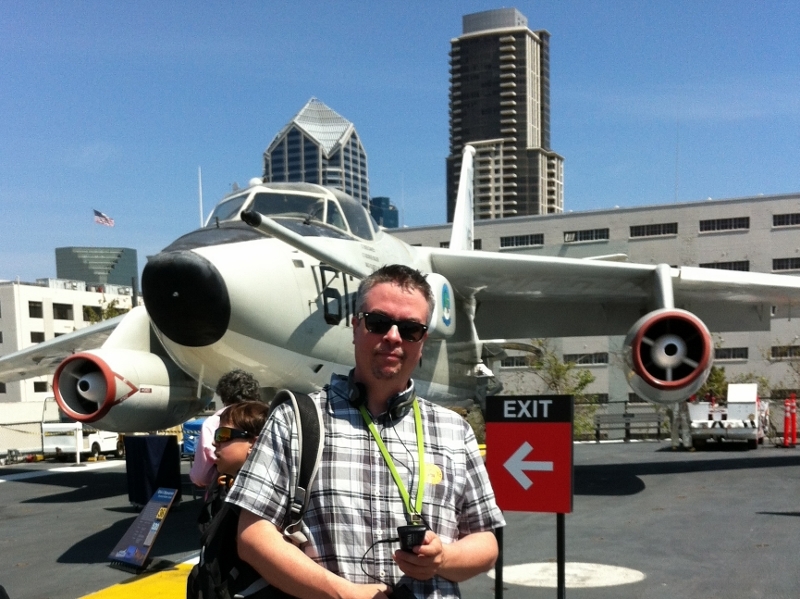 The USS Midway is HUGE. It’s hard to believe how huge it is until you walk onto the lower hanger deck (and this is nowhere near the biggest aircraft carrier.) It’s awe-inspiring to see such an amazing feat of engineering. That so much metal could actually float amazes me. Wooden ships I get. But 64,000 tons of steel made into a ship that’s 972 feet long… come-on, that’s impressive. It is, however, still shorter than the Empire State, the oldest proudly declares. I ask if the Empire State can float? No. Can the Empire State launch an airstrike that can destroy an entire navy? No. Then my aircraft carrier defeats your building, ha! There was so much to see and do on board. WW2 vintage planes to look at. Ejection seats to sit in. Stories about epic battles to be read. Cockpits to climb into and stare out at the Prettiest-girl-in-the-world, fun facts to be recited to anyone who was near me, jets on the upper deck to gawk at, a tour of the lower deck to go on, and, of course, a flight sim. For the youngest to have the best time, he needs to be able to touch things, climb on things, climb into things, climb under things, photo-bomb people and be shout instead of talking quietly. He could do all those here. He must have gone into every cockpit there was. He even strafed his mom once and, like most boys, he did a pretty good machine gun sound. Apparently mommy was invading his island. I’m pretty sure he also dropped bombs on her, too, but his explosion sounds were less convincing. 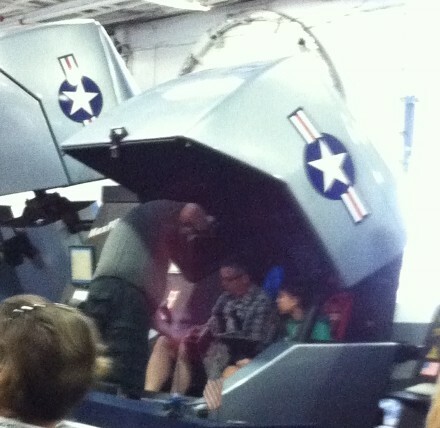 The oldest, from the moment he entered the hanger deck, wanted to go on the flight sim. “Can we go on the flight sim, now?” “What about now?” “How much longer until we can go on the flight sim?” And all of this while we stood in the ticket line. So we climbed in, I assumed the role of gunner, which was not terrible realistic as the Hellcat was a single seat fighter, but whatever. We roared off a jungle airstrip and engaged the enemy. He swerved and dove and rolled as I tried to keep an eye on where enemy planes were and shoot them down. He laughed and cheered and shouted insults at the enemy. In the end, we shot down exactly 0 Zeros. 0. And we got shot down, mostly by other Hellcats, about a dozen times. As I stumbled out and towards the deck tour, I felt sick to my stomach. It wasn’t from trying to kill other people, that never bothers me, but from his aerial acrobatics. Now understand, I don’t ever get airsick, I don’t get car sick, I don’t get seasick and I can watch any movie in IMAX and not want to throw up afterwards. But trying to keep an eye on the enemy planes while the oldest spun in wildly erratic (let’s say defensive) maneuvers, it was more than my brain could take. It took me a few moments to get over being queasy. On the tour of the crew decks, we all had a different experience. 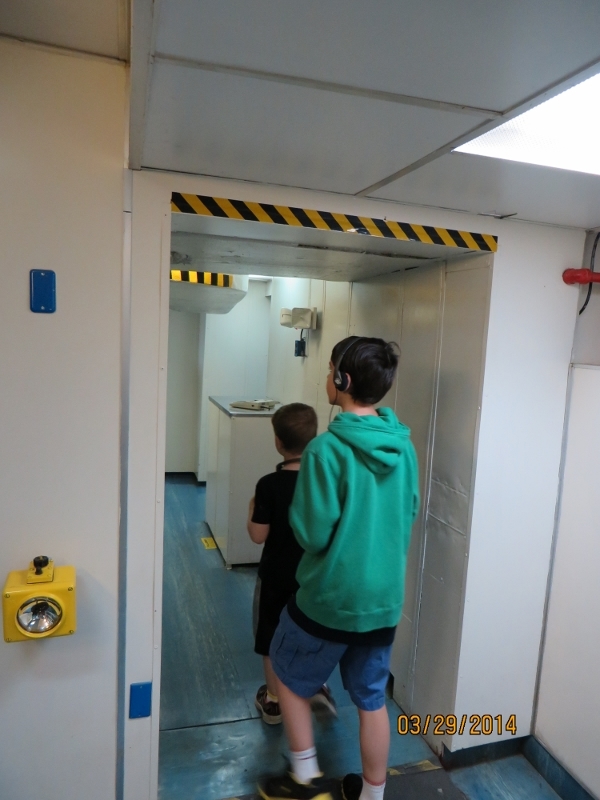 Amazingly, it was the youngest who wanted to listen to all of the audio information about the crew and their quarters, about the galleys and messes and elevators and birthing compartments (I know, odd name), and laundry areas and… well, a lot of stuff. The rest of us were happy to cherry pick the information. Me, I loved ‘experiencing’ the ship. The thick paint coated on the walls and floor. The smell of cloves in the dentist’s office. The snaking mass of wires overhead. The signs on the metals walls. The lingering odor of oil and metal and paint and lino. The small space set aside for each sailor. The wooden walls in the captain’s quarters. The solid metal doors that could be sealed to stop flooding or fire from spreading. The horror of being trapped if those doors were shut. I loved that we had to duck so as to not bang our heads on the hatches. I loved that we also had to lift out feet as well or trip. It kept me alert. I super loved no one banged their head until the very end. 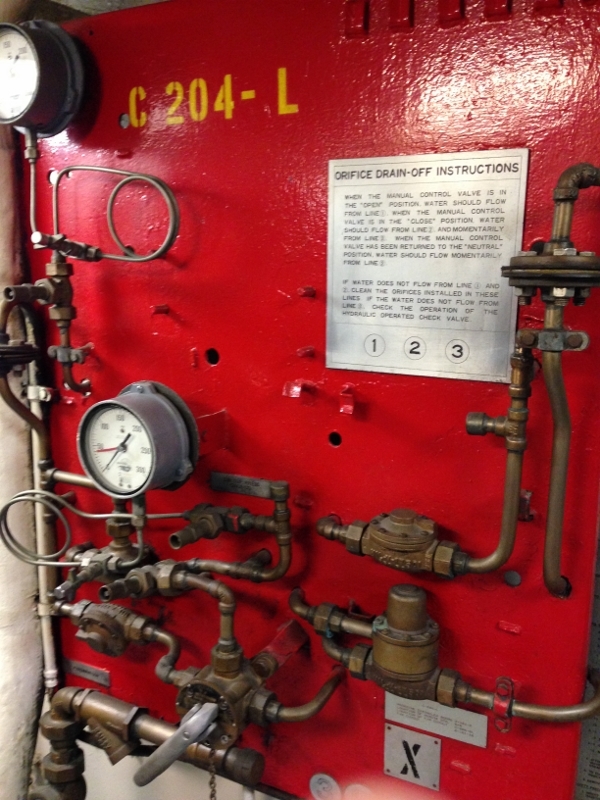 I loved walking up and down the steep, steep stairways and looking down elevator shafts and reading the funny plaques in the Chief Petty Officer’s Mess (they claim, with some justification, that they actually run the ship.) And I loved that there were dozens and dozens of old veterans onboard to answer questions, tell stories and thank us for coming. But it was a long tour, self-guided, and even though we only got to see a small % of the actual space, it gave us all an idea of what life would be like. The oldest vowed he would never join the navy. Too claustrophobic. He would, in a second, join the air force if they let him fly planes. The youngest would have gladly joined the navy if he was made captain. And if they let him play on the elevator and load big shells. I didn’t have to heart to tell them they would also require that he get up on time and keep his room clean. But the Prettiest-girl-in-the-world couldn’t shake the bad feeling she got on the lower decks. She got a bad feeling in the infirmary. She got a similar feeling in the coliseum in Rome. An unsettling feeling of death and pain. I find it amazing she is so connected to the world that she can feel such things. I barely feel the world unless I’m hit in the face by a tree branch or trip on a grass-covered hole. But by the time we were done with the tour, people were hangry and that was not good, there was still the upper deck and all the shiny jets to see. An F-14 Tomcat, A-4Skyhawk, F/A-18 Hornet, A8 Crusader, F-4 Phantom, A-6 Intruder (though I had to look up what the A-6 was called), an E-2 Hawkeye, an A-7 Corsair and a bunch of helicopters that I didn’t know the names of. So, while the boys climbed in and out of another cockpit, while the Prettiest-girl-in-the-world caught a bit of sun, I ran around the flight deck looking at the planes, taking a quick picture, reading the call-signs painted on the sides, and trying to catch a bit of the cool lecture giving by an old F-4 pilot who’d fought over Hanoi. Oh, I would have loved to spend a MUCH longer time there, but hangries trump planes so we headed off in search of food, leaving the planes and the history behind. 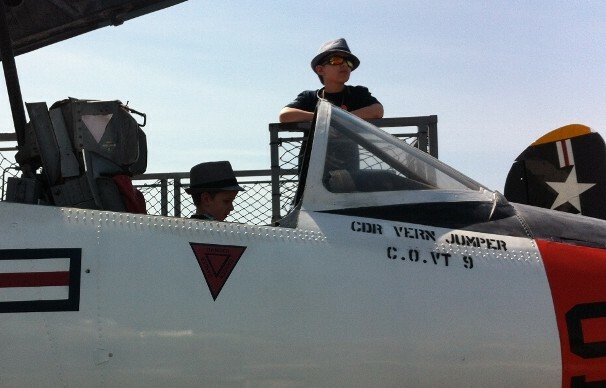 This entry was posted in Blogging, Parenting, San Diego, Travel, Traveling with Kids, writing and tagged A-4Skyhawk, A-6 Intruder, A-7 Corsair, A8 Crusader, aircraft carrier, chief petty officer, E-2 Hawkeye, F-14 Tomcat, F-4 Phantom, F/A-18 Hornet, flight sim, hangry, humor, mess, prettiest girl in the world, schmennis, Traveling with children, US Navy, USS Midway. Bookmark the permalink. Wow–I’m envious. 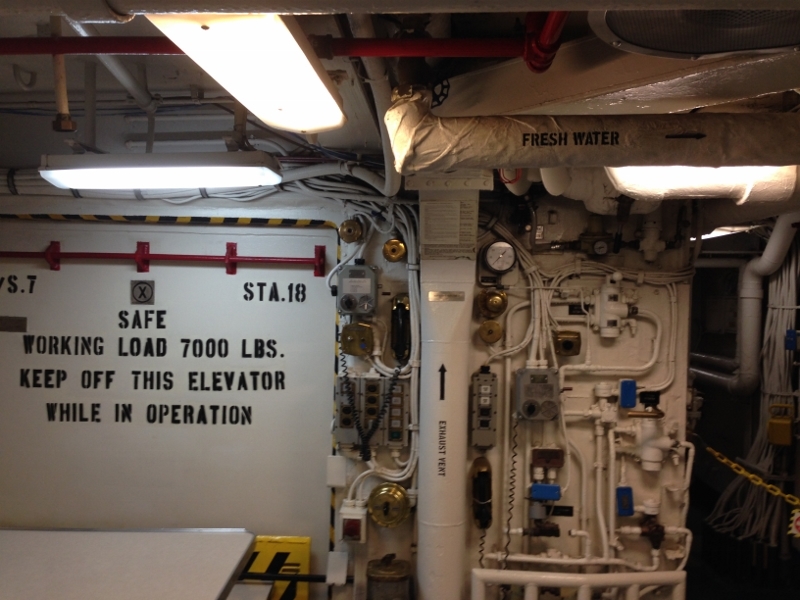 I’ve never been aboard a really big ship: the largest was one of those guided missile cruisers. It’s always hard when people you care about don’t share your enthusiasms. They should have turned the mess into a restaurant, serving typical mess food. That could have been fun. Ha! Mess food! Wouldn’t that be a hit. 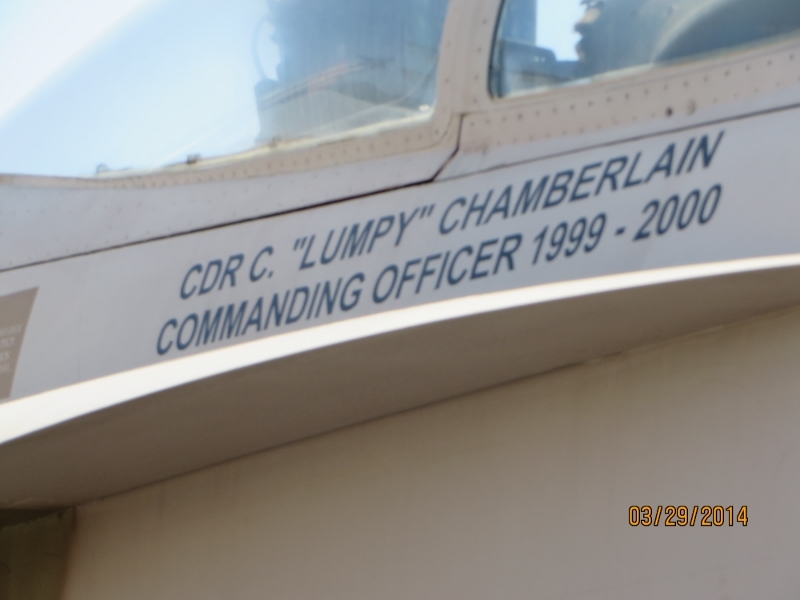 If you ever get a chance, go see an aircraft carrier. Since I won’t be alive when the launch the spacebarges to battle the alien invasion, this was the most amazing ship I’ll ever see.